There are three formal and two informal reporting periods each school year. Our Kindergarten students receive their formal written report cards at the end of each term. Students received their first report card last December, the second report card will be given out on March 6, and the third report will be distributed at the end of June. This year, the two informal reporting periods are a parent-teacher interview, held last fall, and the Student-Led Conference. A Student-Led Conference is exactly that–a conference or interview for you and your child, led by your child. During the Conference, students assume the ownership for reporting and demonstrating to their parents what they are learning about in school. The teacher, who has supported the students in the selection of student work and practiced the conference with them, stays in the background during the actual Conferences. Student-Led Conference. A brainstorming session of possibilities would ensue. There would be suggestions such as a polished piece of writing, the latest math test or a Science notebook; the class would vote on the ideas they liked best and those selections were included in their Student-Led Conference folder. Depending upon the grade, sometimes we had a combination of “must-have” work and some student choices. An “art walk” around the school hallways, the latest digital learning project and a mini music performance were other fun choices to round out a Student-Led Conference. A week or two before the Conference we had our older students write a letter inviting their parents to attend. The letter would highlight the learning and personal achievements students wanted their parents to particularly notice. This was a wonderful opportunity for student self-reflection of his or her successes. For our Kindergarten students we organize our Student-Led Conferences by Centres. It’s a system the children are familiar with, and one in which we’ve used successfully with this age group. In the weeks prior to the Student-Led Conference, we review with your children the activities they enjoy most in our day and want to share with you. We also initiate some discussion on the learning we think you would enjoy seeing as their parents. 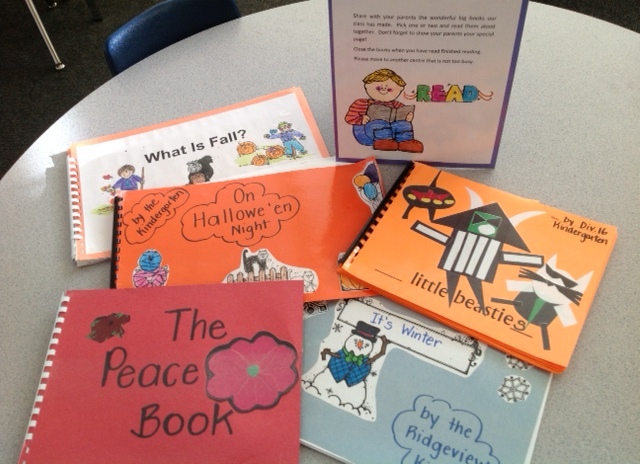 We typically include a Language Arts Centre which focuses on the children’s Alphabet and Writing Books; a Math Centre to create math patterns and showcase their Math Books; and a Scrapbook Centre to see some of the best work we’ve completed in Kindergarten this year, in the children’s individual scrapbooks. With the children’s help, we form an “Agenda” of the Centres the children will lead you through. When you arrive with your child at our classrooms, your child will be given a personal copy of the Agenda and he or she will mark each activity with a sticker as it is finished. The Centres do not need to be completed in any particular order, but each one must be visited. We explain to the children that if they see there are many families at one Centre, then they should choose another until it’s less crowded. During your child’s Conference, parents are able to enjoy looking at their child’s schoolwork and participate in the activities he or she has selected for you. As parents, giving specific praise and support recognizes your child’s efforts at school. It is through your comments that you model what you value about your child’s learning. This is a time for positive comments only to your child. At the end of the Student-Led Conference we ask our parents to sign the Guest Book. It’s important for us to have a record of parent attendance and receive feedback every year. Over the years parents have always enjoyed the Conferences so it’s very rewarding to have the appreciation of your children’s, and our, efforts. This year the Kindergarten Student-Led Conferences will be held on Tuesday, March 3 and Thursday, March 5. All Ridgeview students will be dismissed at 1:50 pm on Tuesday only, and the Conferences will begin at 2 pm. You will have a 25 minute time slot with your child. A maximum of four-six Conferences will be held at once so families need to be prepared to speak softly. At the appointed time, we will ring a bell to signal the end of the Conference so that we may prepare for the next group. Over the years, a few parents have asked why they cannot have an interview with the teacher instead. To put it simply, the reason why you’re having a Student-Led Conference is because it’s an incredible opportunity and privilege to share in the learning of your child. You will hear about your child’s learning from your child’s perspective, and have that deep insight into your child’s thinking, motivations and achievements. You will be engaged in a dialogue rich with the language of a young learner, share the joy of a job well done, and a sense of pride with every printed letter and cut out shape. And you’ll be able to share in the delight of your Kindergarten child as he or she begins the journey as a life-long learner. 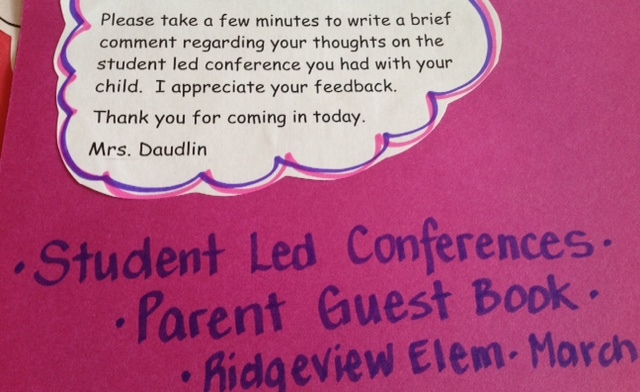 Student-Led Conferences are one of our favourite days of the entire school year. From a teacher’s perspective, we couldn’t be any more proud of our students as they beam with pride at leading their mom and dad into their classroom to share the fabulous work they’ve completed at this point in the school year. Please make arrangements for siblings so that your Kindergarten child can have your full attention during his or her Conference. You can sign-up for your Student Led Conference starting Monday, February 23 at 3 pm.